Brevet Major, U.S.A. for gallant conduct in Mexico, 1847. Brig. Gen. C.S.A. Army of Northern Va. 1864. General-In-Chief, N.C. Troops, 1861. In Command of Western N.C. 1865. 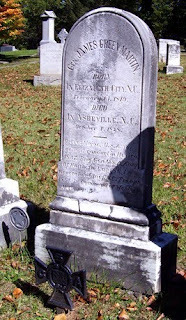 General Martin was laid to rest in Riverside Cemetery; Asheville, Buncombe County, North Carolina. He was a son of Dr. William Martin and Sophia Dange. General Martin was known as "Old One Wing" because he lost an arm in the Mexican War.